A few weeks ago we made our fall trip down to Baraboo, Wisconsin to visit friends and check out the fall colors. Our first stop was Pewits Nest. Unfortunately the colors were gone and most of the leaves were on the ground. The good news is they enlarged the parking lot so more than 4 or 5 cars can park at any given time. In past years we sometimes had to skip the visit because the parking lot was full. When you find yourself in a situation where the subject you came to shoot is not what you expected you then start looking for alternative subjects. On this day I concentrated on photographing close up photos of leaves in the water. 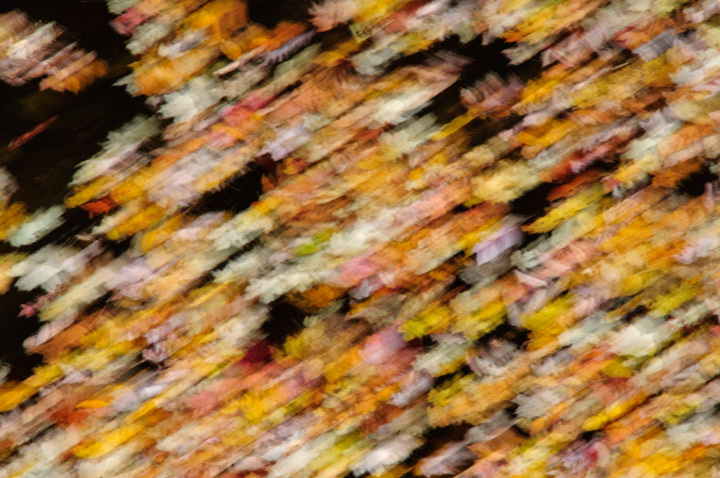 It is sometimes difficult to hit the fall colors just right. I’ve had the most success visiting Ironwood at the end of September some of the other locations I try to judge the fall colors using the Wisconsin Fall Color Foliage Report. I’m starting to think about fall color trips. Typically my fall season starts with a trip to Ironwood, Michigan at the end of September. 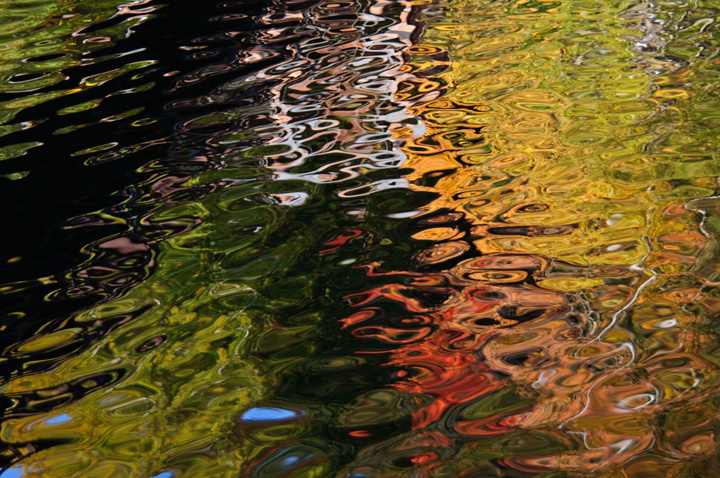 My two favorite photograph locations are Gile Flowage. Gile Flowage is a great place to start the morning by photographing the sunrise. Later in the day I like to drive over to Copper Peak International Ski Flying Hill and make the trip to the top of the ski jump. There are some spectacular views from the top of the ski lift. In mid October I like to drive over to Munising, Michigan. This is probably one of the premier fall color locations in the country. While I’m in the area there are three locations I like to visit. The first is Hiawatha National Forest. 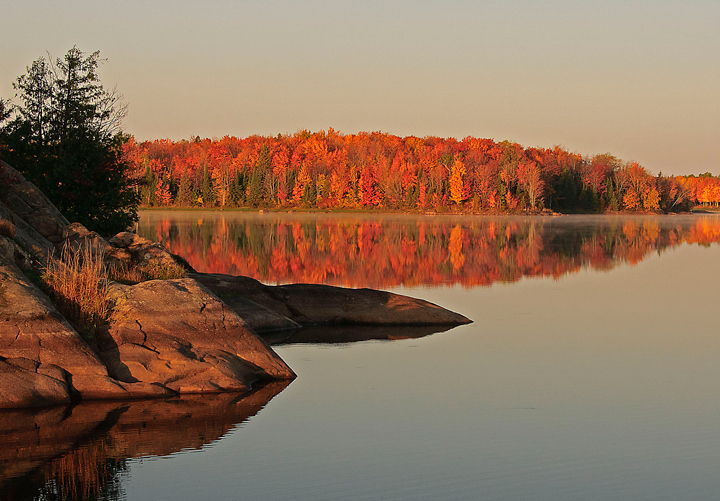 There are quite a few lakes in the forest that offer some spectacular fall color shots. 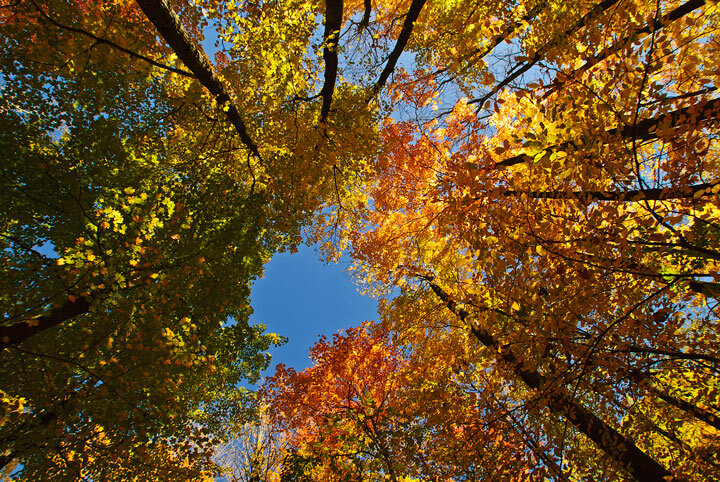 The leaves turn first in the National Forest. If you are really lucky you will be in the area when the snow falls on the colors. 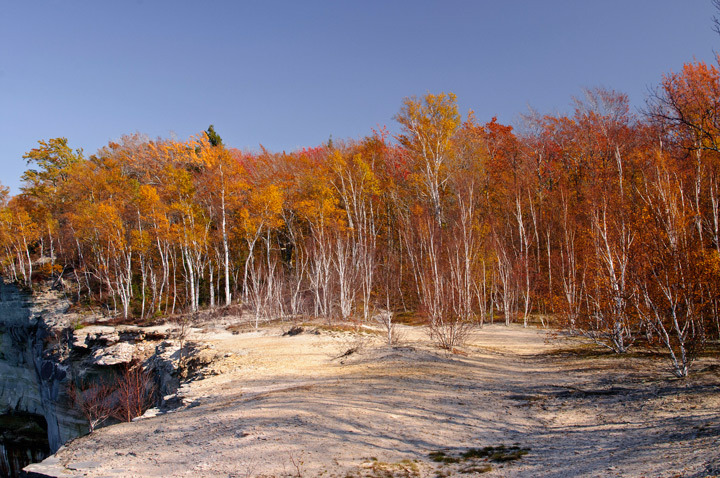 A week or so later the colors will turn at Pictured Rocks National Lakeshore. Hiking along the trails above the lake offer some unsurpassed scenery. If the weather cooperates a sunset cruse on the tour boats is well worth your time. While in the area I always try to visit Seney National Wildlife Refuge. 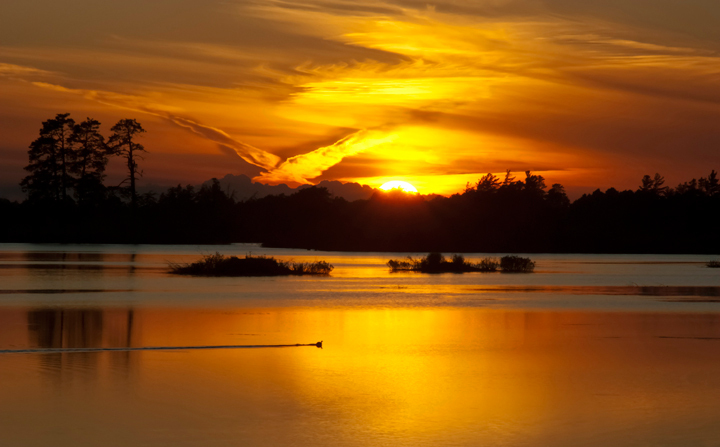 It offers some spectacular sunrise and sunset opportunities as well as a chance to photograph wildlife. Toward the end of October I like to drive down to Baraboo, Wisconsin. There are some great photography locations in the area. Devils Lake State Park is always popular and can be crowed on a beautiful fall Day. Gibraltar Rock offers some great views of the Wisconsin River Valley. My favorite location is Pewits Nest. If you time it right the leaves can be outstanding. Pewits Nest is small natural gorge cut by Skillet Creek. Pewits Nest is my favorite Wisconsin State Natural Area. It is located just outside Baraboo, Wisconsin. We visited on an overcast fall day when the fall colors were near their peak. I’ve compiled a list of my favorite fall photography destinations. The links go to additional photos on my website. 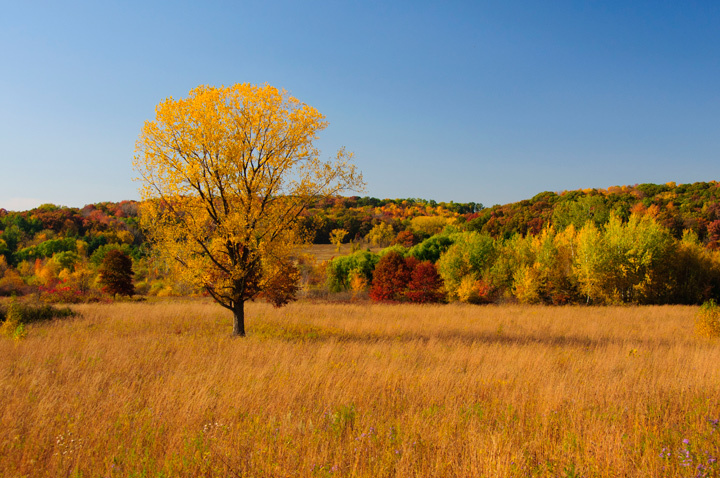 Blue Hills – Drive through the back roads of the Blue Hills east of Rice Lake and you will find beautiful fall colors. 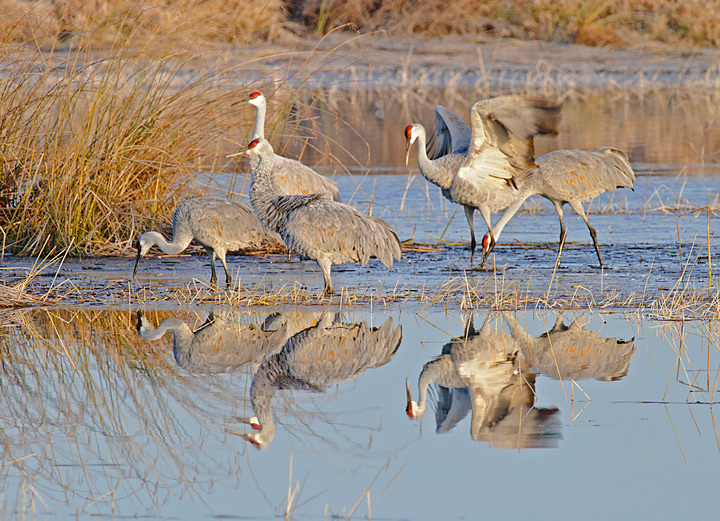 Crex Meadows – In October and November you will find thousands of migrating Sandhill Cranes. 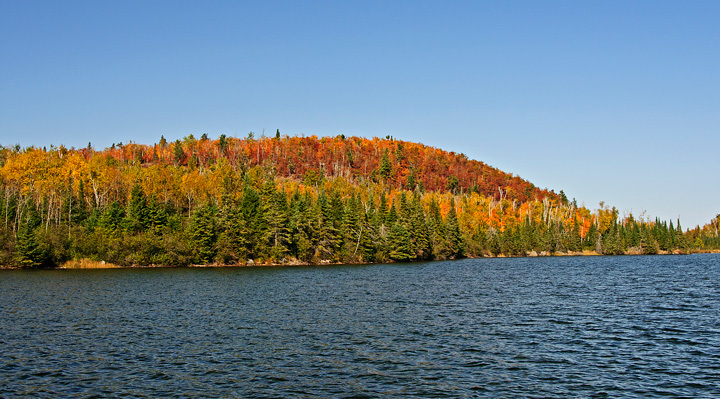 Devils Lake State Park – Beautiful fall colors. Gibraltar Rock – Overlooks the Wisconsin River valley. Gile Flowage – An often overlooked gem. The fall colors turn in the Hurley area early. Parfreys Glen – A beautiful walk up a small stream through giant boulders. Pewits Nest -The best of the Wisconsin State Natural Areas. In mid-October my wife and I were in the Madison, Wisconsin area. I the fall there is no better place to visit than Pewit’s Nest. 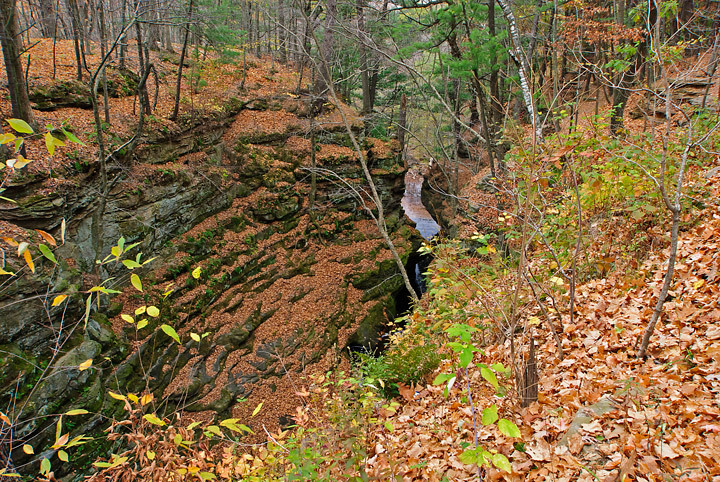 Pewit’s Nest is located just outside Baraboo, Wisconsin and is one of the 653 Wisconsin State Natural Areas. It isn’t very large but I think it is one of the most beautiful of the Natural Areas particularly in the fall. The main feature of the Natural Area is a 40 foot deep gorge with Skillet creek running flowing through the bottom of it. At one time there was a crude mill at the mouth of the gorge. Apparently before the mill was built a man lived in the walls of the canyon in a home resembling a phoebe (peewit, an earlier name for the bird) hence the name Pewit’s Nest. The area surrounding the area consists of a hardwood forest and when the leaves are tuning this small area becomes a dream location for photographers. the parking area is very small and during the peak leaf season it is usually full of cars. We lucked out this year because the leaves were near their peak color. We were lucky that it was an overcast day which made for good shooting conditions without harsh light in the gorge. When the fall leaves are done in northern Wisconsin we usually make at least one trip to the southern part of the state. One of the places we like to visit is Pewits Nest near Baraboo, Wisconsin. If you hit it just right with the leaves this can be a fantastic place for photography. Unfortunately, we have not had the best luck. A couple of years ago we arrived at peak color only to find that a heavy rainstorm the day before had taken down many of the leaves. This year it was the drought. The leaves were not all that great and many of them had turned brown and fallen. 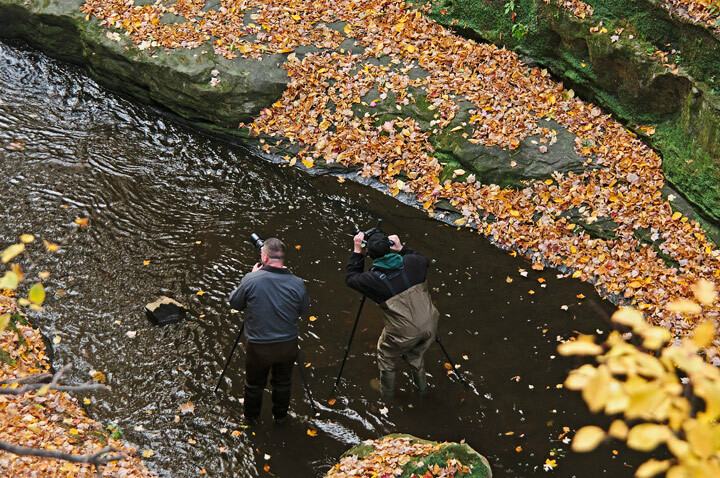 The water levels in the stream were low and a couple of photographers had put on their waders and were able to walk down through the gorge. More photos from Pewits Nest can be found on my website. It’s the time of year when I start getting excited about the fall colors. 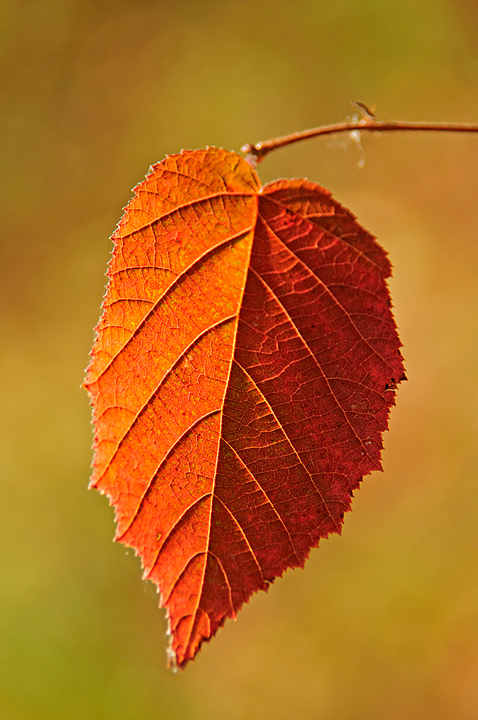 Already some states have their fall color reports active. I started thinking about the places I would like to travel to this fall and came up with a list of my top 5 destinations. I’ve listed the ironwood area first because, for some reason, the leaves turn in this area before they do in any other area. Gile Flowage– is located just south of Ironwood, Michigan. What I like about Gile Flowage is that you can photograph at sunrise and sunset and get some great photos. In fact, at both times you can photograph the color of the trees and just turn around and then photograph the rising or setting sun. Copper Peak International Ski Flying Hill – is the largest ski jump in the world and the top of the jump is nearly 1200 feet above lake Superior. On a clear day you can see for over 40 miles. Lake Superior and the Porcupine Mountains are visible from the top. The ski jump is open on weekends during fall color season. 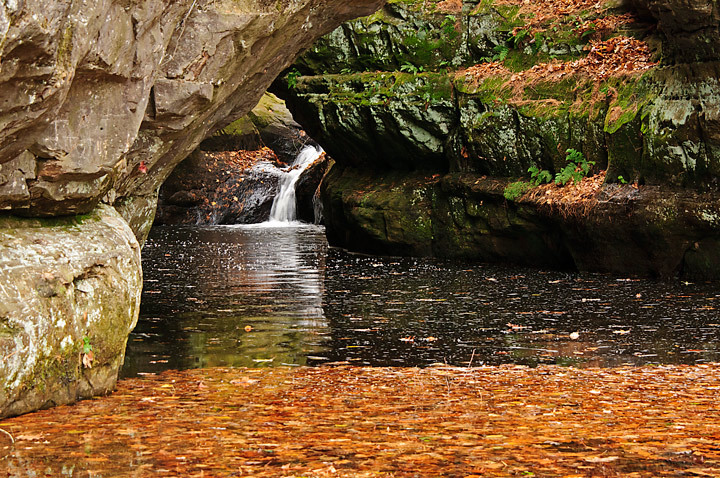 Black River – is just down the road from Copper Peak and offers some great fall views of waterfalls along the Black River. Hiawatha National Forest – is located just south of Munising and offers some great photography opportunities along the many lakes in the area. 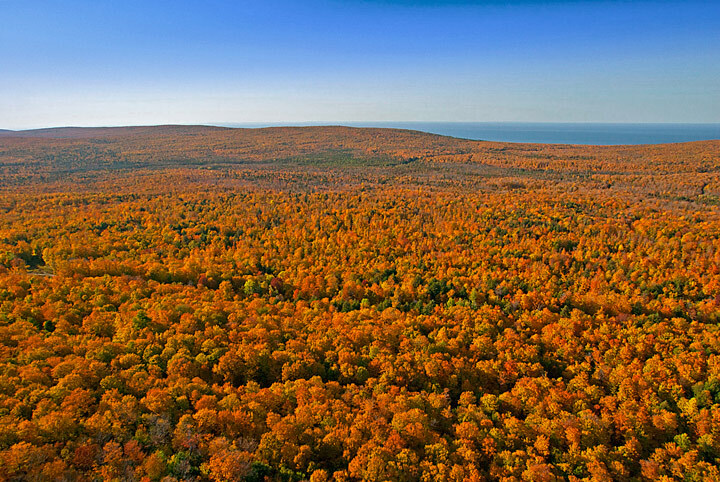 The peak colors in the national forest are usually a week or so before the colors in Pictured Rocks. Most of the lakes are best photographed early in the morning. More information can be found in an earlier Blog. Pictured Rocks National Lakeshore – offers some spectacular photo opportunities. The fall sunset boat cruise is not to be missed. 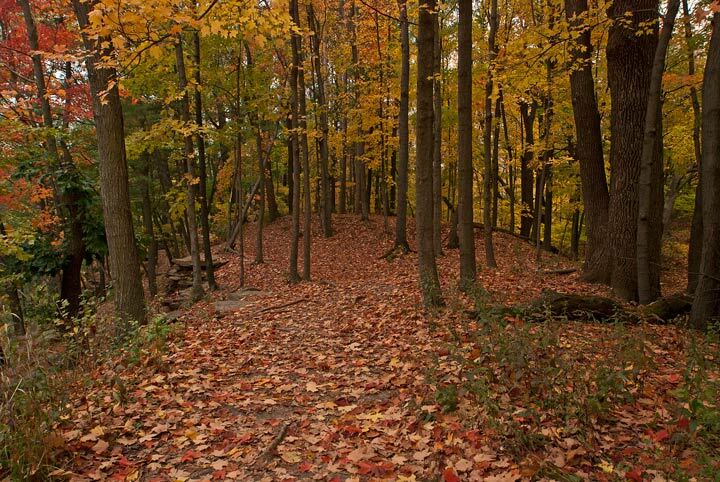 The many mile of hiking trails through the park offer a wide range of subjects for photography. 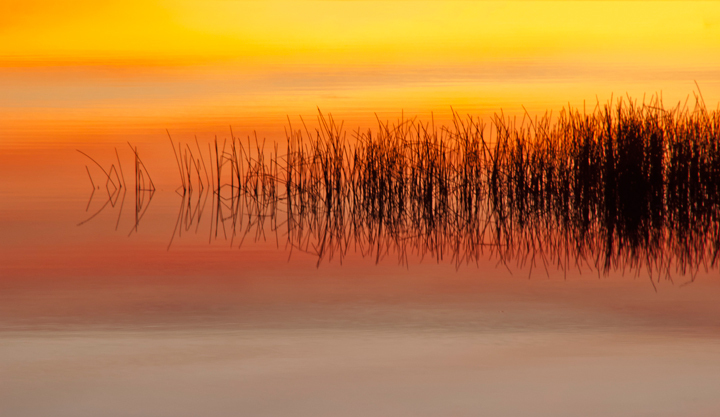 Seney National Wildlife Refuge – is located at the eastern end of Pictured Rocks and offers some great chances for sunset and sunrise photography. Large numbers of Trumpeter Swans can be found in the Refuge. 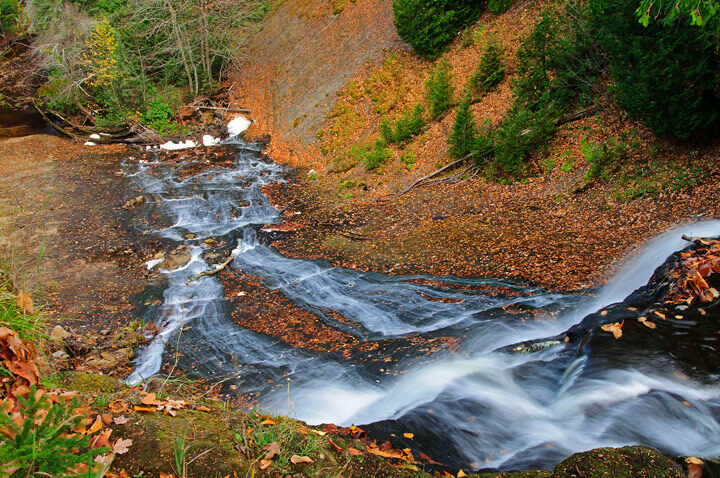 Waterfalls – There are a large number of great waterfalls within a short drove of Munising. 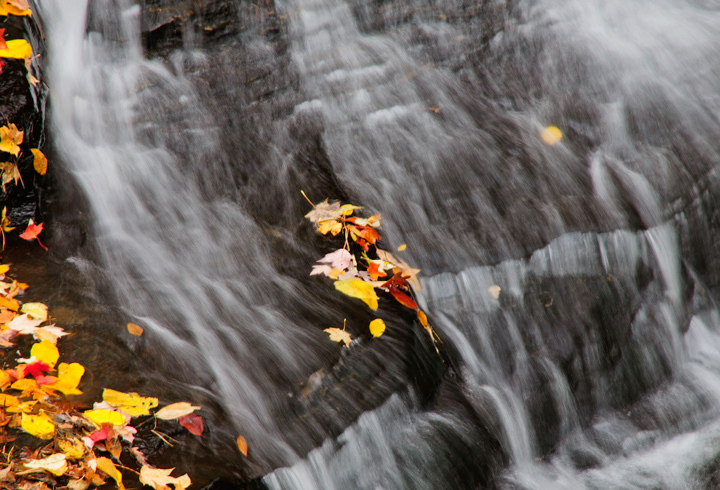 This is a shot of Laughing Whitefish Falls. 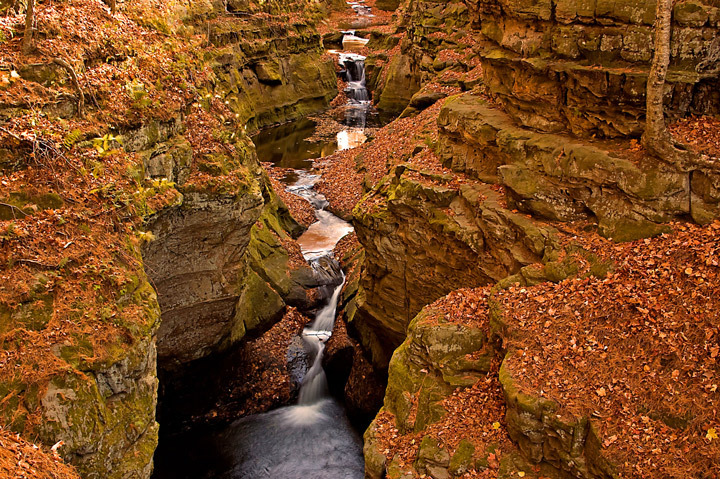 Pewits Nest –is located in the southern part of Wisconsin just outside Baraboo. It’s a small gorge with a stream flowing through it. The top of the gorge is covered with large maple trees. If you hit it right the maple trees are spectacular. The gorge itself is worth the trip even after most of the leaves have fallen. Devils Lake State Park – Is also located just outside of Baraboo. 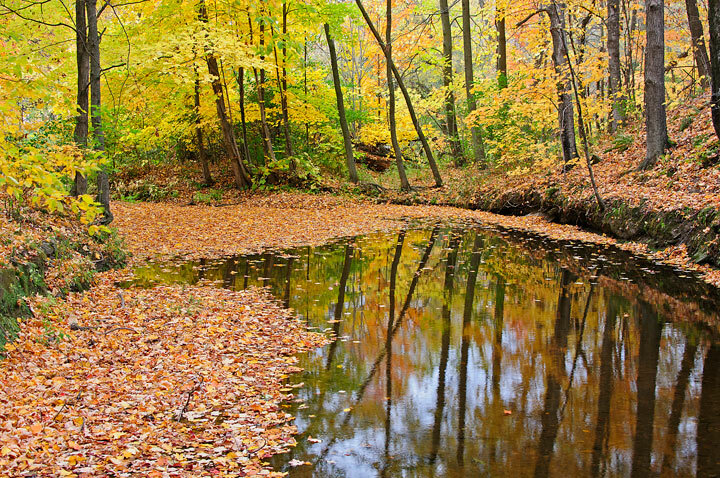 It is one of the premier Wisconsin parks and a popular destination any time of the year but particularly in the fall. We usually combine the trip with a visit to Ski-Hi Fruit Farm which lies just outside the park. 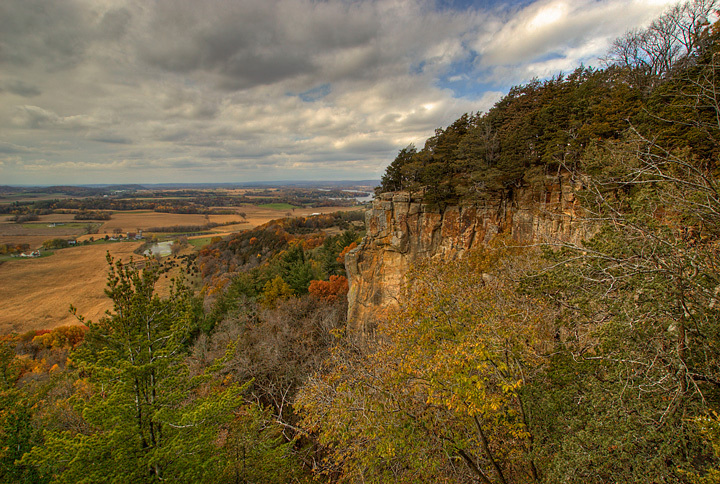 Gibraltar Rock – Is just a short drive from Baraboo and offers some stunning views of the Wisconsin River valley. We usually combine a visit to Gibraltar rock with a trip on the Merrimac Ferry which crosses the Wisconsin River at Merrimac Wisconsin. 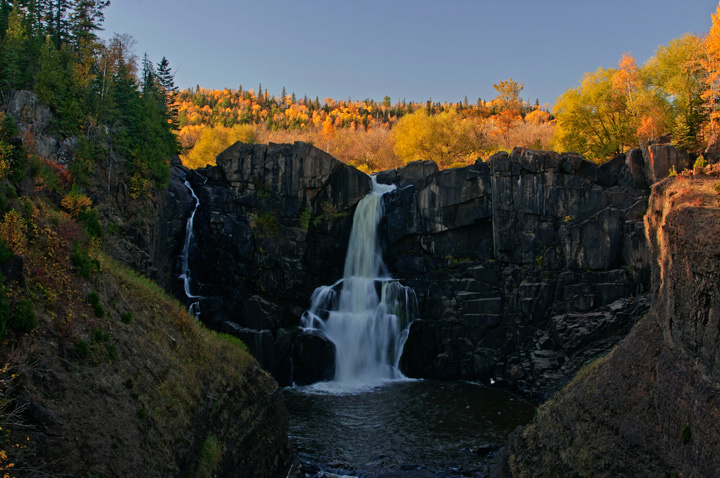 There are photography opportunities all along the Minnesota North Shore from Duluth, Minnesota to Grand Portage State Park on the Canadian Border. I’ve highlighted a few of my favorites. The fall leaves turn first in the interior away from the lake. The Maples turn earlier than the Birch. 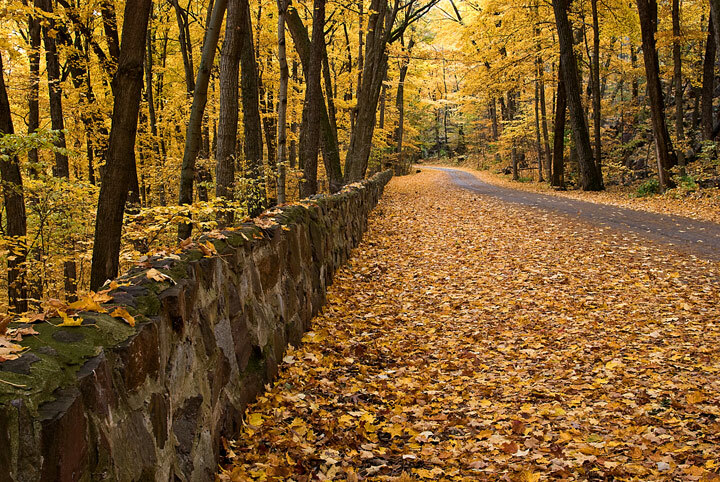 Generally it will take several trips at different times to take in all of the fall color along the North Shore. If the leaves disappoint the Lake will not so there is always something to photograph. 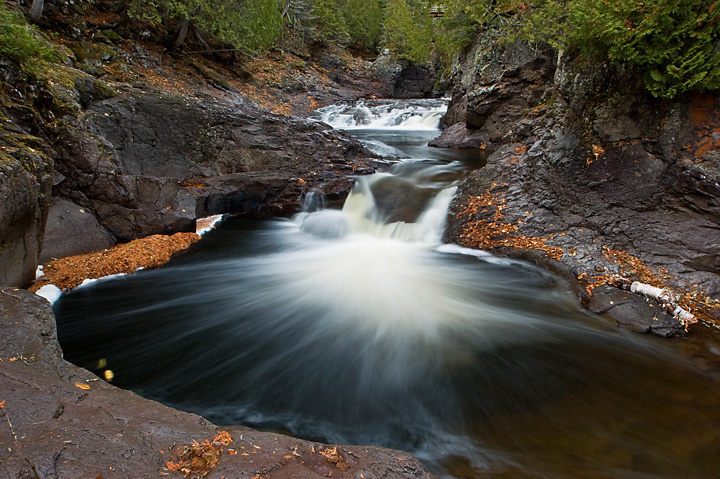 Gooseberry Falls State Park – This is usually my first stop on any trip to the North Shore. I try to time my visit so I’m not there on a weekend because it is one of the most popular parks in Minnesota. Tettegouche State Park – They are building a new visitors center at the park so the visitors center will closed for the fall 2012 season. Lots of nice hiking trails into the back country. 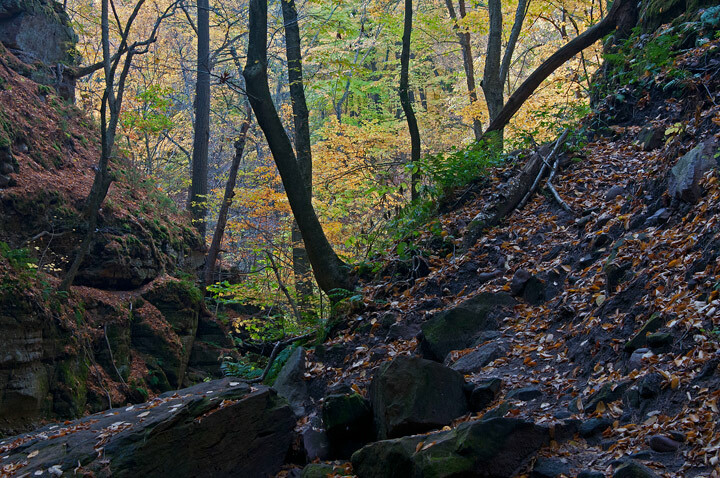 Oberg Mountain – My favorite place for fall photographs on the North Shore. 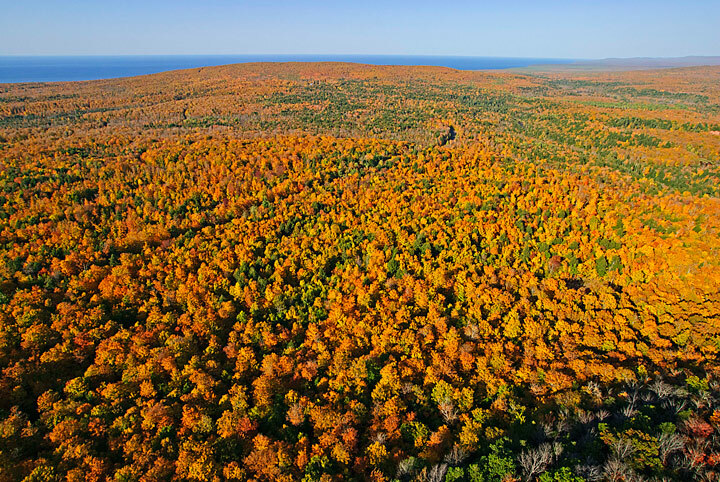 The top of Oberg Mountain offers stunning 360 degrees of the surrounding forests and Lake Superior. 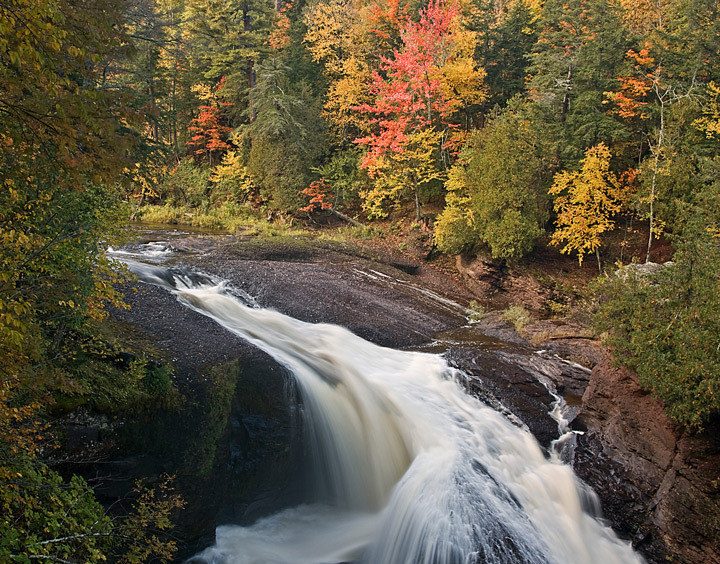 Cascade River State Park – is a great place to photograph any time of the year but it can be beautiful in the fall if the water level is high. Best photographed early in the morning or late in the day when the cascades are in the shade and provide a uniform light. Grand Portage State Park – is located on the border with Canada. 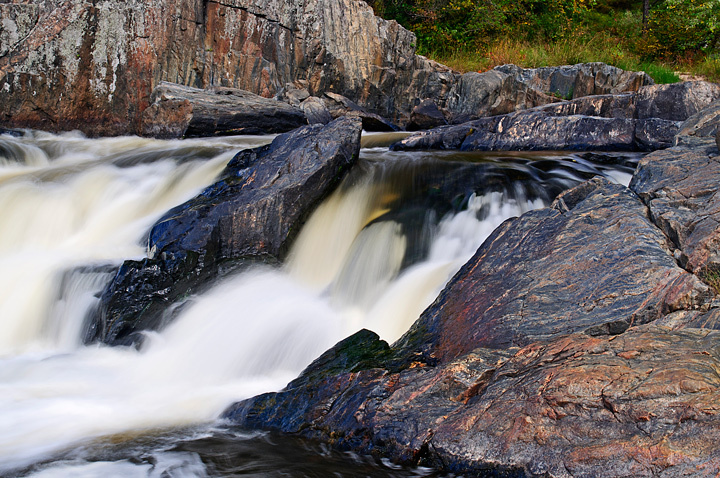 It offers spectacular views of the highest waterfall in Minnesota. Late in the fall color season the Birch Trees at the top of the falls turn brilliant colors. If you happen to be there late in the day the sun will highlight the fall colors while the falls is in the shade. Crex Meadows stands alone as a destination for photography. 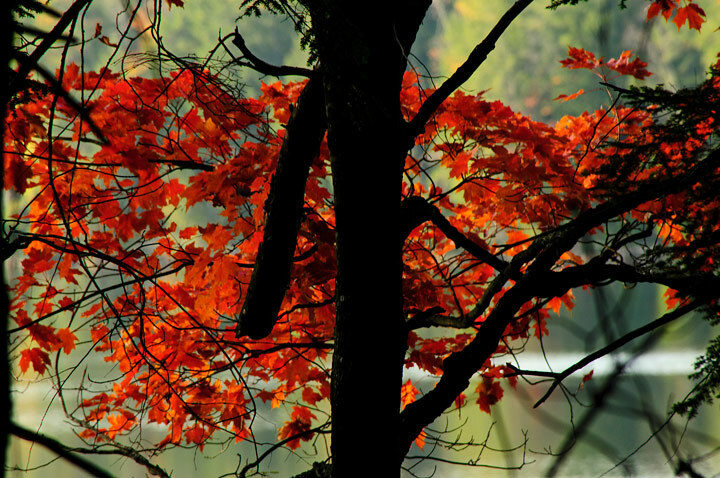 It is a great place to photograph fall colors, sunrises and sunsets. 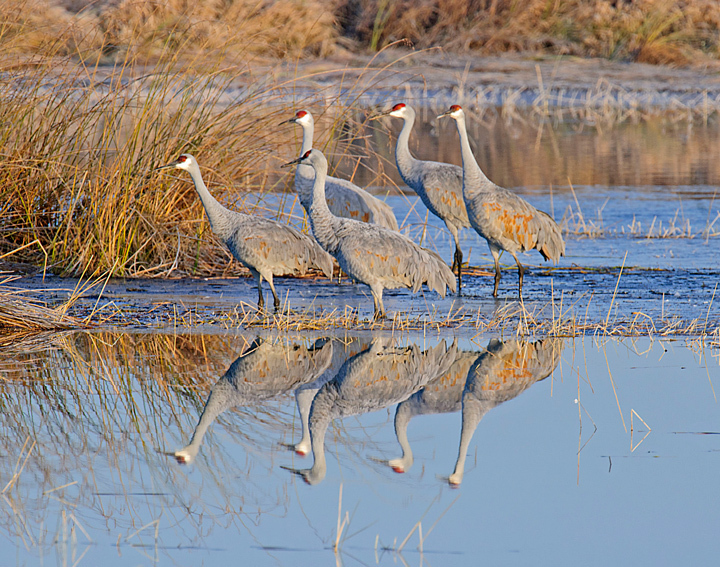 It is also the one of the best locations in the country to photograph the fall migration of the Sandhill Cranes. 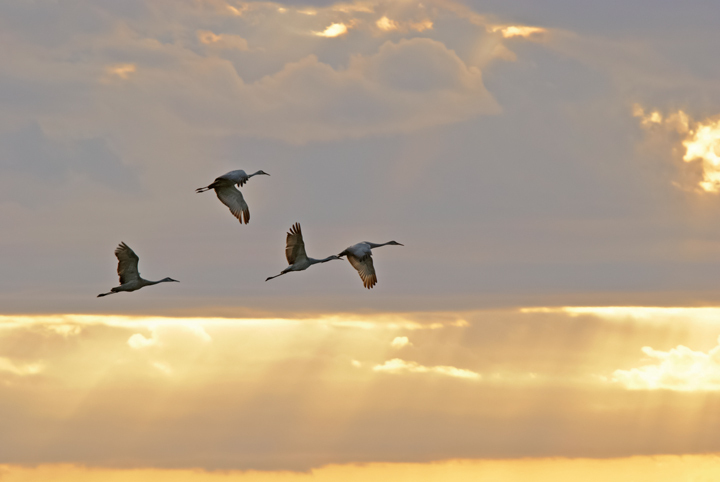 You will want to plan on spending the night in Grantsburg, Wisconsin so you can take in the evening and morning flights of the cranes. About an hour before sunset the cranes start returning to the meadows. Folks bring their lawn chairs and just sit and watch them fly into their rousting grounds. You can return to the same location at sunrise and watch the cranes leaving to feed for the day in the surrounding fields. During the day you can drive the back roads south of town to watch the cranes feeding. 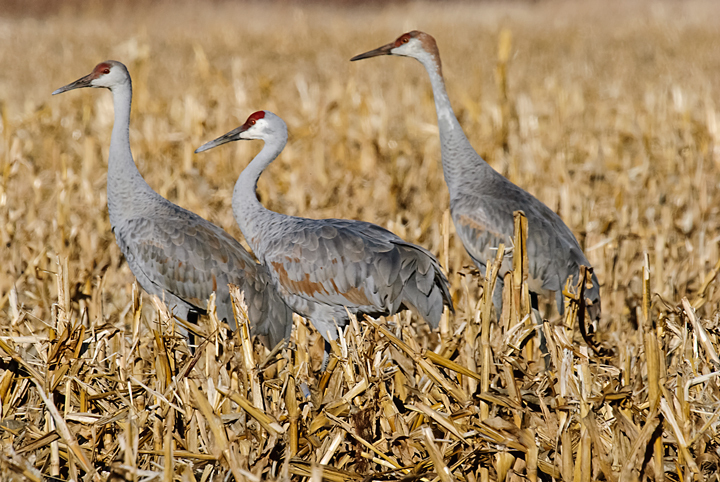 Make sure you make the trip this year because if the Wisconsin creates a Sandhill Crane hunt you may not be able to see this spectacular event in future years. I have more details on photographing at Crex in an earlier Blog. Now that fall is officially over I can post my favorite fall photographs of 2011 and start looking forward to winter photography. I chose this photograph of a Sumac patch because of the interesting patterns. Sumac are generally the first to show the reds of fall. 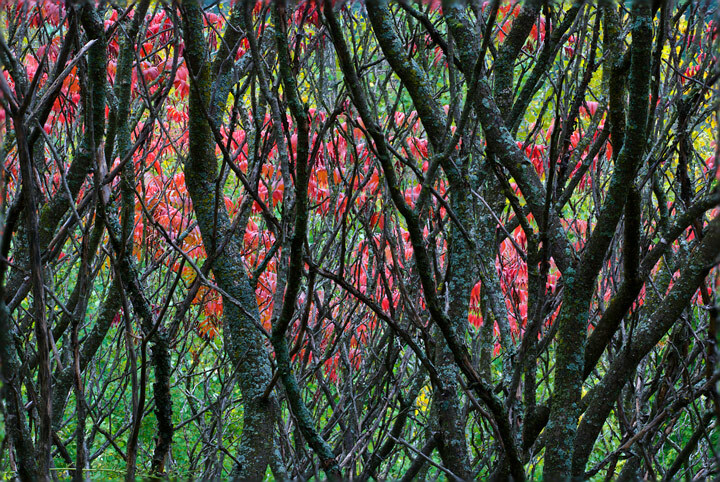 It was taken on my farm after a rain that darkened the color on the Sumac bark. 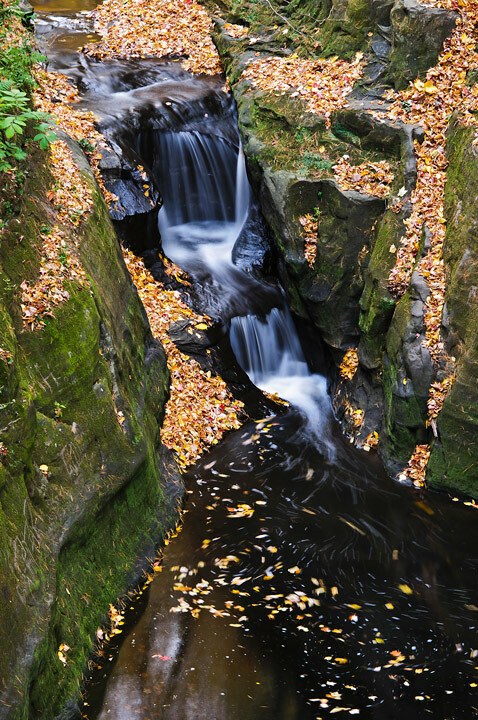 This small waterfall was taken early in the fall at Big Falls County Park east of Eau Claire Wisconsin. We had started over to the park earlier in the day when it was cloudy out. By the time we arrived the sun was going in and out of the clouds making it difficult to shoot. I managed this shot shortly after the sun went behind a cloud. On an early fall trip we drove up to Copper Harbor, Michigan. 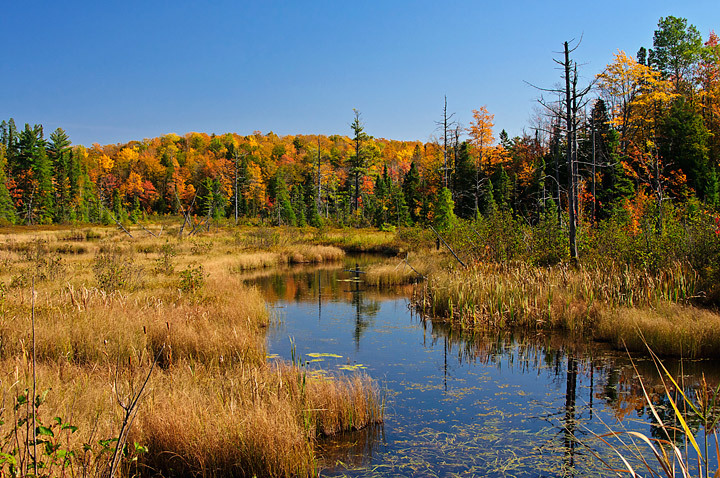 The quality of the leaves varied but this bog shot taken just south of Houghton, Michigan showed the start of some fantastic color. I love taking fall reflection shots. 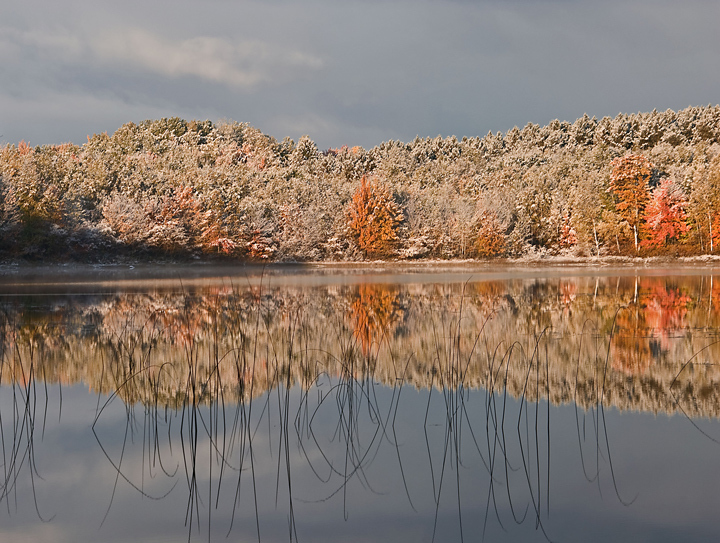 This was my favorite reflection shot of the season taken at the mouth of the Black River outside Ironwood, Michigan. It was taken from the docks under the footbridge over the river. This photo was taken from the top of the Copper Peak Ski Flying Hill outside Ironwood, Michigan. You can see for miles from the top of the ski jump. There was still a lot of fall color in spite of the heavy winds earlier in the week. You can see Lake Superior in the background. 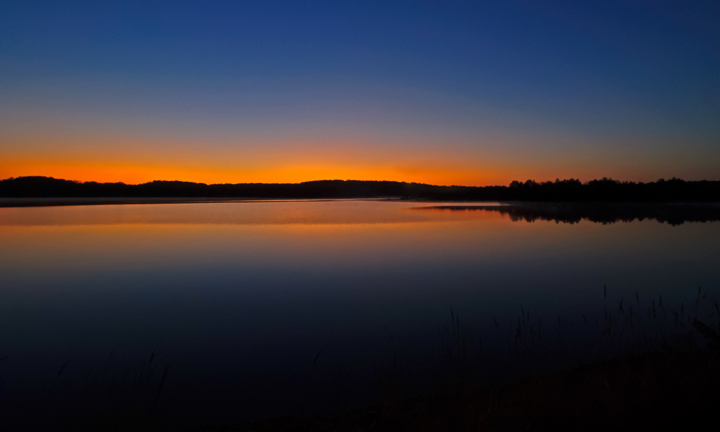 My wife and I had driven out to Gile Flowage just outside Hurley, Wisconsin to capture the sunrise. It is a great place to photograph because you can shoot the sun rising and turn around and shoot the early light on the trees resplendent in fall color. We had actually finished shooting for the morning and were driving to a place where we could turn the car around when I decided to take a couple of more shots. This turned out to be the last shot and my favorite. 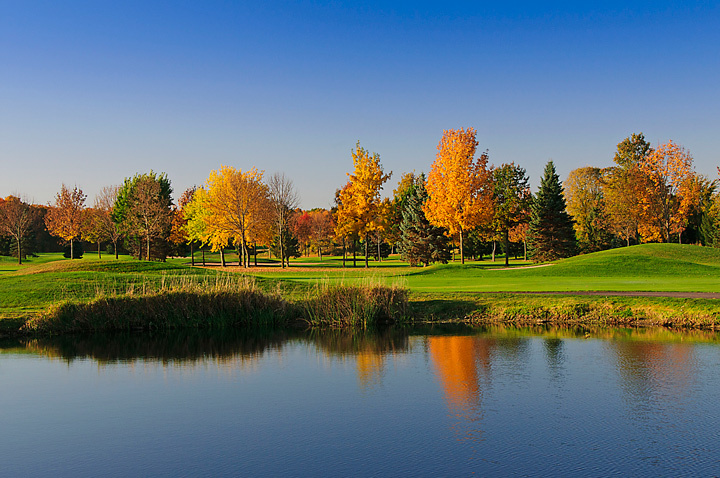 My wife had a meeting at meeting at Turtleback Golf Course in Rice Lake, Wisconsin. I rode along and planned on spending the day out photographing fall colors. As I drove into the parking lot I noticed the beautiful colors and captured this shot. Later that same day I was driving around in the Blue Hills east of Rice Lake. Late in the afternoon I managed to capture these bright yellows. I really like this backlit scene taken near Pete’s Lake south of Munising, Michigan. 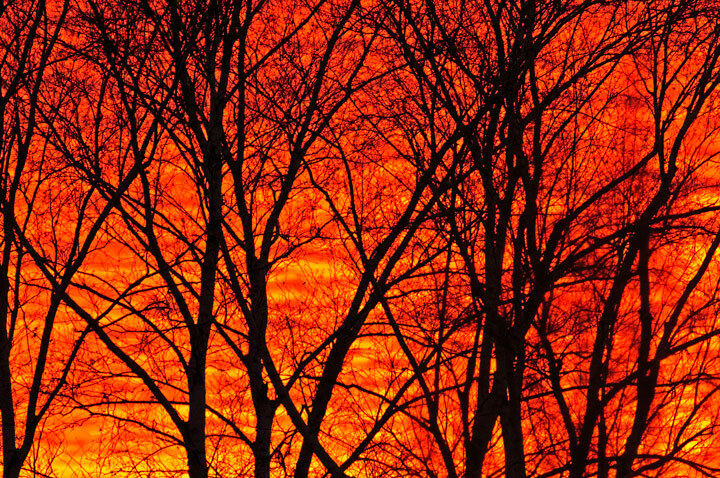 I darkened the tree trunks to create a contrast with the bright reds and pastels in the background. 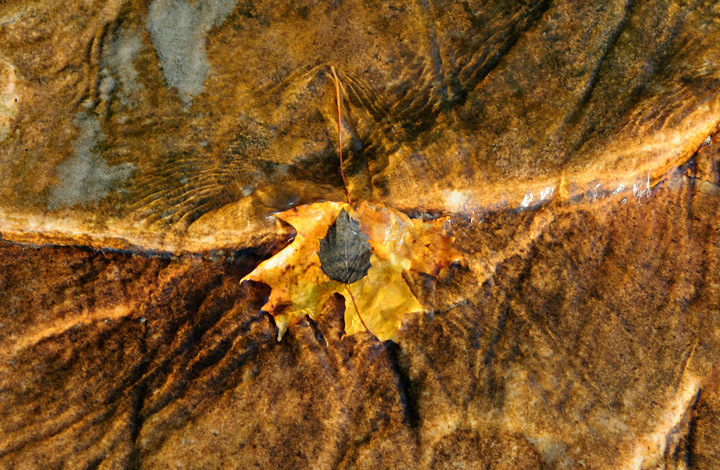 This photo of a leaf on leaf was taken at Pictured Rocks National Lakeshore. I was photographing late in the day at Miners Beach. I was attracted to the leaf and the water and rock patterns just below Elliot Falls. This is a shot taken from the top of Laughing Whitefish Falls east of Munising, Michigan. I tiptoed between the river and the viewing stand to get to the top of the falls and look over the edge and took the shot with a wide angle lens. Pewits Nest is one of the Wisconsin State Natural Areas. 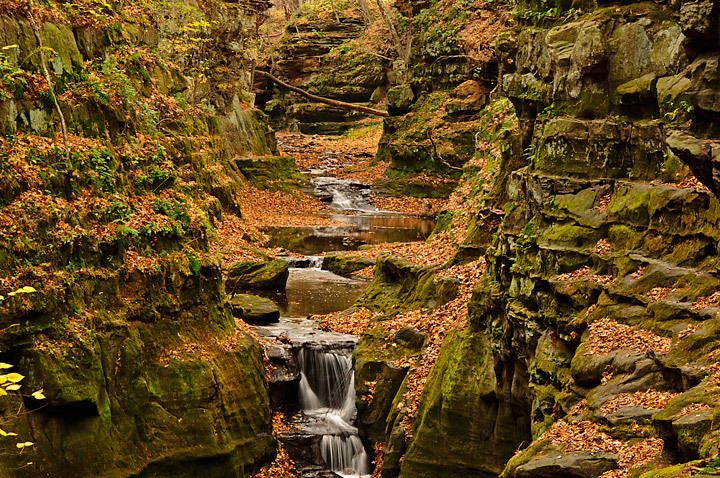 It is located just outside Baraboo, Wisconsin. It is a popular photo location in the fall when the leaves are turning. Unfortunately most of the leaves were down when we arrived but it still makes for a spectacular photograph. Crex Meadow was the location of three of my favorite photos. All of the photos were taken within a couple of hours of each other. The first photo was taken as sunrise on Phantom Lake. I had originally planned to drive directly out to the Sandhill Crane roosting grounds but the sunrise on this particular day was so spectacular that I couldn’t pass it up. After photographing the sunrise I drove on to the rousting grounds for the Sandhill Cranes. The sky was very dramatic and I caught this small flight of Sandhill Cranes heading out for their feeding grounds. This last photo was taken a little while later. Most of the Sandhill cranes had already left for their feeding grounds but I found a small group of them standing in some thin ice early in the morning. Shortly after this was taken they headed out for the day. When most of the fall colors are gone and there are just a few leaves remaining I concentrate on photographing single backlit leaves. You can get some dramatic photographs using this technique. 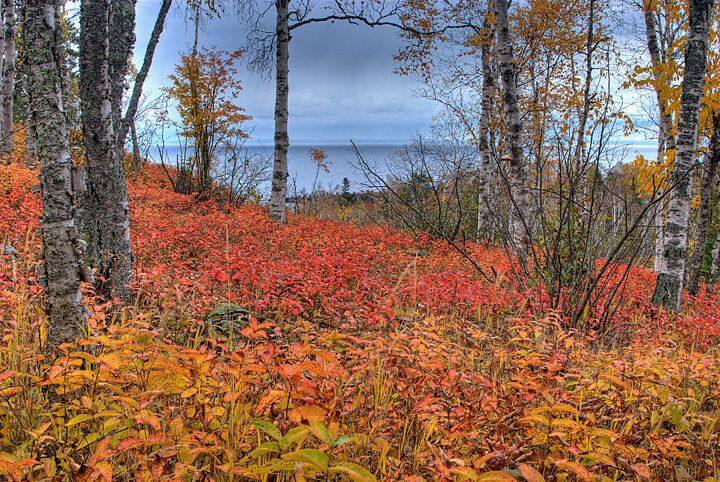 This hot was taken late in the fall at Duluth, Minnesota. 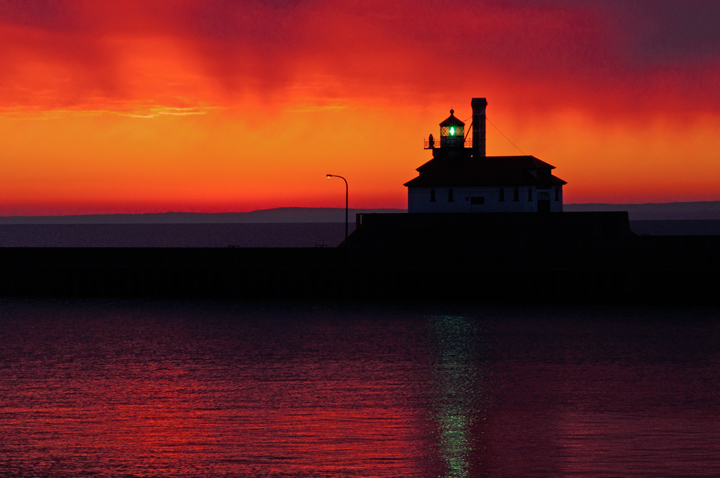 It shows the South Breakwater Outer Light during a spectacular sunrise. We had stayed at a motel in Canal Park specifically so I could photograph a sunrise. When It came time to get moving I was a little slow until I saw the bright red color in the window. I was outside photographing in less than 10 minutes. A couple of weeks ago my wife and I were in the Madison, Wisconsin. I the fall there is no better place to visit than Pewit’s Nest. 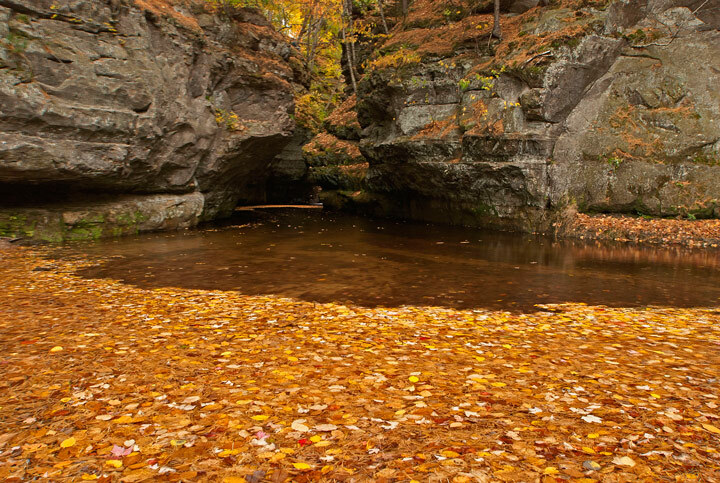 Pewit’s Nest is located just outside Baraboo, Wisconsin and is one of the 653 Wisconsin State Natural Areas. It isn’t very large but I think it is one of the most beautiful of the Natural Areas particularly in the fall. This small area is a dream location for photographers. This fall the leaves were mostly down when we visited but it happened to be a cloudy day which made for good shooting conditions. 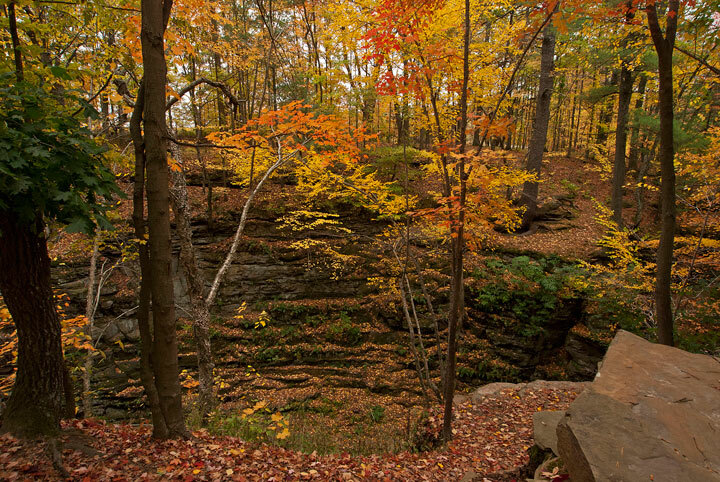 The main feature of the Natural Area is a 40 foot deep gorge. At one time there was a crude mill at the mouth of the gorge. Apparently before the mill was built a man lived in the walls of the canyon in a home resembling a phoebe (peewit, an earlier name for the bird) hence the name Pewit’s Nest. More Pewit’s Nest photos on my website.